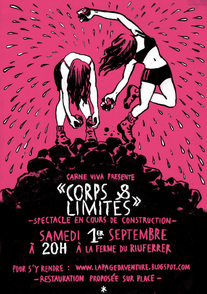 "Gr10-corps limites" is a 50-minute play of two moving bodies, the fruit of a year-long investigation into the body and its limits. During our creation residencies (10 days each season of the year in the most contrasted environments possible: rural, urban, industrial ...), we immersed ourselves in a quasi-obsessional way on themes that are for us in direct connection with the notion of limit. Thus, we have experimented: exhaustion, restriction (food, physical, verbal), social imitation / metamorphosis in nature ... always in close connection with the environment around us. We have sought to push our bodies / minds / emotions to their limits in order to create a primary choreographic language and as honest as possible.